"A great alternative to fast-food French fries. My family and friends love these as a snack or hors d'oeuvre. No matter how many I make, it's never enough!" Thick or thin, whole or French cut, raw or cooked, green beans are the best side. I love roasted vegetables but roasted green beans just didn't work for me. Thanks for sharing. 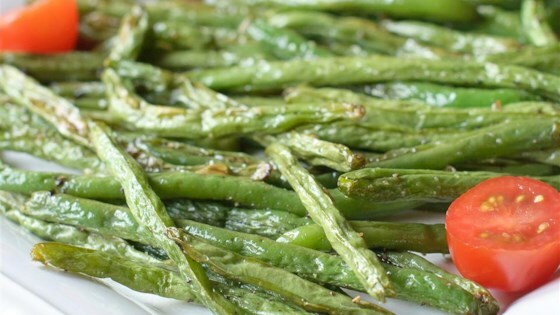 I loved these green beans, my only complaint is that I didn't make enough of them! I can easily see them being a healthy replacement for french fries! Pretty good but check at 20 minutes. Mine were thick and they were done at 20. Loved it! I love roasted vegetables and these were caramelized and so sweet. Thanks for the recipe.